Dais Nagao is a designer with Harley-Davidson. 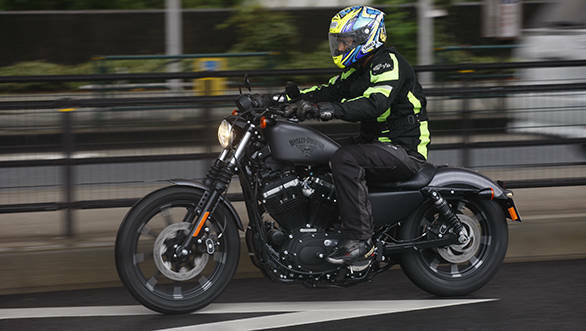 Of Japanese origin, he's been in the US for 20 years and as we spoke to him over the day of the ride, it quickly became clear that he draws a lot of inspiration from the urban custom movements and the new Iron 883 shows off a lot of those cues. Nagao spoke of urban bobbers being pared down, spartan-ised motorcycles that appealed with their directness and simplicity. Blacks, greys and the other colours of that dark palette are the colours of urbana and it's always been one of the reasons why the Iron 883 looked so correct in that matte black shade. Nagao worked on the 2016 models to expand the palette and flavour. He says the bike was designed to look a little rough around the edges and the colours  a lovely green and an even neater grey  were selected because they allow urban dirt and long stints between washes to make the bike look even better. He goes so far as to say that as urban motorcycles pick up nicks, scuffs and other signs of use, the new paints absorb these and make them part of the appeal and story of the motorcycle. Under that paint is the same motorcycle more or less as the 2015 Iron. That's not a bad thing. The old Iron was a lovely Sportster and so is this one. On our Tokyo ride, it was the hardest motorcycle to swap with the other journalists. Between the light clutch and the swift torque delivery, it isn't hard to see why.